In this competitive world of corporate, there is a way to be successful in the business. A company runs well because of its hardworking and skilled employer and the employees. There is a possibility that a company may think of offering a competitive company employee a deal to switch their position to their company with better position and pay. This is called employee poaching. Poaching Employees is possible when a competitive company employee has been offered a job in another company. An employee who is an important asset of a company is offered a better deal than in existing company by the competitive company then it will be considered as employee poaching. There are certain elements to consider while a company decides to poach other company employee and they are as follows. Employee poaching is considered as a very convenient way for all the industrialists to target their competitive company. A successful company may not succeed without its skilled employees and those employees who really stood out in that particular company will be a target of competitive company to be poached. There is a possibility that the rival company decides to offer such talented employee to make some profit out of his / her skills. An employee poaching is most probably possible with those employees who are considered as an asset of the company and they have been unhappy lately. During this unhappy and unprofessional period of time, a competitor of that company can take advantage of that particular chance and can also try to instigate that employee to think of agreeing for an employee poaching. While the decision of employee poaching is going to be taken, a company needs to re – think this decision for the sake of the company. An employee poaching is not an easy task, where no one is going to be affected by this decision. When the decision of an employee poaching takes place, the rival company needs to be sure with the offered deal, which is ten times better than the existing working company deal. During the time of internal differences or breakdowns, there is a possibility that a competitor can take advantage of that particular chance wherein which he / she can convince an employee who is an asset to that company to agree for an employee poaching. And it is possible that because of one mistake or break moment, a company can suffer millions within seconds of time. After the decision of an employee poaching takes place, the rival company needs to be sure of their decision that there shouldn’t be any breakdowns for it. Before making any kind of deal with that poached employee, the company needs to be sure of all the consequences. These consequences may be positive or negative, but it has to be taken with responsibility. And take such responsibility to deliver a careful take off. When a company makes a deal with an employee of rival company with better benefits and security, it is possible that the rival company employee may be bound with a certain kind of contract with that company and without knowing that there is a possibility that the poached company may get themselves into a trouble. Therefore, to avoid such legal troubles from rival company it is better to be aware of all the legal term of that company clearly. After taking every single thing into consideration and working out all the legal terms of existing companies, the rival company needs to be prepared with their offer or deal to that particular employee who they want to poach to their company. After calculating all the best possible deal to offer, a company need to pitch that offer to that particular employee so that after hearing that particular deal, he / she should not refuse to take such offer or deal. Once an employee has been poached, the rival company needs to be a little more alert because there may be a possibility that the targeted company may seem some kind of revenge out of the rival company. Therefore, to avoid such sudden activities the rival company needs to be alert after all the process of an employee poaching has been completed. And make sure that the targeted company has no motive legal motive against their employee poaching. While deciding about the certain kind poaching deal, the rival company needs to look into all the elements to be mentioned in that particular deal which is beneficial for both the employee and the rival company. Because, as it is case of employee poaching, the rival company needs to be sure that the employees, whoever is being poached is loyal to that company after considering all the legal offers designed for him / her. Once the deal has been presented to the concerned employee, it is necessary that whether the deal for the rival company has any meaning for the targeted employee or not. Sometimes, it is possible that the targeted employee won’t be interested in the offer or deal of the rival company. And at that point of time the rival company should take that refusal in a healthy way, never think of pressurizing them to that deal or offer. While targeting an employee from the targeted company, the rival company needs to understand that the thing which is going to help an employee poach that particular employee to the rival company is friendly communication. Instead of pressurizing them and targeting them all the time to take that offer, one can at least try to deliver an honest effort to communicate with that particular employee with a very friendly way. While approaching an employee of the targeted company needs to understand one thing that to present their offer to that employee, the rival company needs to be aware of all the existing facts. And always avoid any kind of illegal activity which create problem during employee poaching. And to avoid such issues, the rival company needs to understand their limits and never try to cross such limits. How to Avoid Poaching Employees? All successful companies can start imposing certain contractual obligation for all the important employees of the company to prevent themselves from the employee poaching. Mentioned below are certain obligations to prevent an employee to be poached by another company and they are as follows. Every chief employer of the company needs to look into that all the employees of his / her company are satisfied with the employment facilities of the company. And they start imposing certain kind of contractual obligation for those employees who are really beneficial for the company. By imposing certain kind of contractual agreement between a company and the employee, there is a possibility that rival company won’t be able to poach such an employee. While entering into a contract with a company, an employee need to be sure of all the legal obligations with that particular company. 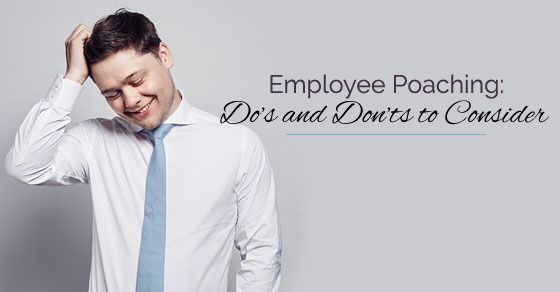 And to prevent the employee from poaching then all the employers can receive a written letter from the employee acknowledging all the specified agreements and also assuring the company for not accepting any kind of employee poaching options. If a company is willing to save themselves from employee poaching then it is necessary to understand all the hidden and disclosed details of those competitors and their competition. By collecting all the details about the competitors and their competition, a company prepares themselves for an unexpected employee poaching issues. If a rival company decides to target one of the employees of the rival company to switch their position with the other company. If an employee with his / her own wish tries to poach him / herself to another company then at that point of time the company can take necessary legal action against them for the breach of contracts intentional. As explained before, an employee working in a company can be offered a deal with better benefits and pay to transfer his / herself to another company abiding all the legal obligations. During these kind of changes it is possible that another company which has been targeted can take certain action against another rival company if an employee is abiding contractual obligations of the company. During an employment process a candidate abides oneself to the terms and conditions of that particular company which he / she cannot breach during the employment in that particular company. It is possibly expected that all employees of the company need to follow all the duties given to them during their employment. And If there is any kind of breach of agreement or any other damage occurs, then the company take legal actions against that employee as per the company rules. If a person being a valued employee of that company discloses any secrets of the company while receiving an offer of employee poaching with better pay and benefits, then that abiding company can take certain legal action against that employee as per the rule of breach of contract. And even press any legal charges against them for exchanging company secrets with another company for the benefit of him / herself. While entering into a contract with the company, an employee agrees to all the rules and regulations of the company which include certain employee poaching obligations. These employee poaching obligations can be revoked only by the time when an employee or a rival company tries to involve themselves into an employee poaching activity. A company can impose another agreement to prevent employee poaching from rival company that all the employees working in that company cannot be allowed to poach themselves to another competing company or else If any person tries to poach with a competing company, then as per the rules and regulations, that employee and the competitor company can be liable to receive legal obligations. While entering into a contract with a company an employee need to understand and follow all the rules and regulations of the company. And they are abided by the rules of the company that any kind disclosure of trade secrets can be obliged to legal allegation on that employee without any mercy. Therefore, to avoid such things an employee need to be loyal to that company without any kind of hidden agenda. To end this discussion, we would say that employee poaching is not an illegal term of switching an employee from one company to another company. But to be fair enough, it is a legal process where in which a rival company can target an employee of another company to be shifted to their company. These employee poaching is a process where a company decides to present a deal in front of the other company employee to join their company with the best benefits and payments. Therefore, employees poaching can be termed as the best way to communicate with the rival company employee where in which that employee can decide to poach him / herself to another company with their own wish.